Description: This Feb. 15, 1996 photo shows the Linear Aerospike SR Experiment (LASRE) pod on the back of a NASA SR-71. Pictured is the half-span lifting body model and linear aerospike rocket engine (white portion), which are sitting on the deflection plate that separates the experiment from the canoe (long black shape). The canoe held propellant tanks and instrumentation equipment, and serves as the mount for the experiment. The entire pod weighed just under seven tons. 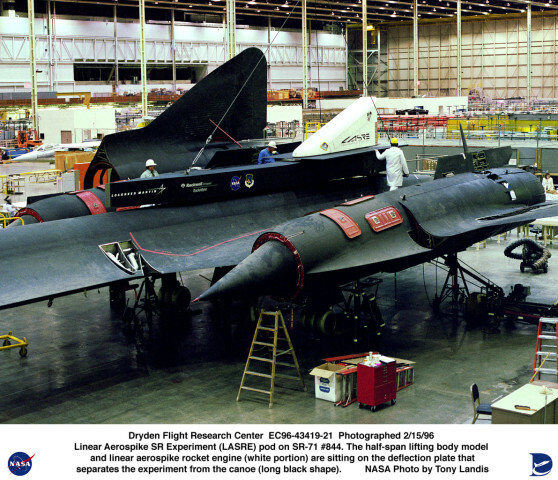 Keywords: SR-71; LASRE; Linear Aerospike SR Experiment; pod; Lockheed Martin Skunkworks; X-33; Reusable Launch Vehicle; canoe; deflection plate; engine flight data; Dryden Flight Research Center; aerospike; LASRE; linear aerospike rocket engine; Linear Aerospike SR-71 Experiment.